Blogger tells use that your content is forever. That promise is generally true - if you observe basic common sense and courtesy. Don't accidentally delete the account, or the blog. Don't lose control of the blog. Your content is forever - as long as you do not violate TOS. If you violate TOS - publish malware or spam, copy content rudely from other blogs and websites, include dangerous or dodgy content, or generally act impolitely - both your Blogger account, and any blog(s) are subject to deletion or suspension. Blogger will frequently exercise patience, for some first time offenders - but claiming that you never received a warning email will not entitle you to a second chance. 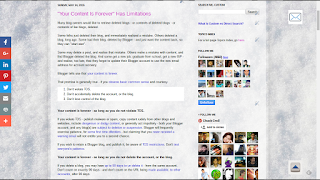 If you wish to retain a Blogger blog, and publish it, be aware of TOS restrictions. Don't test everyone's patience. 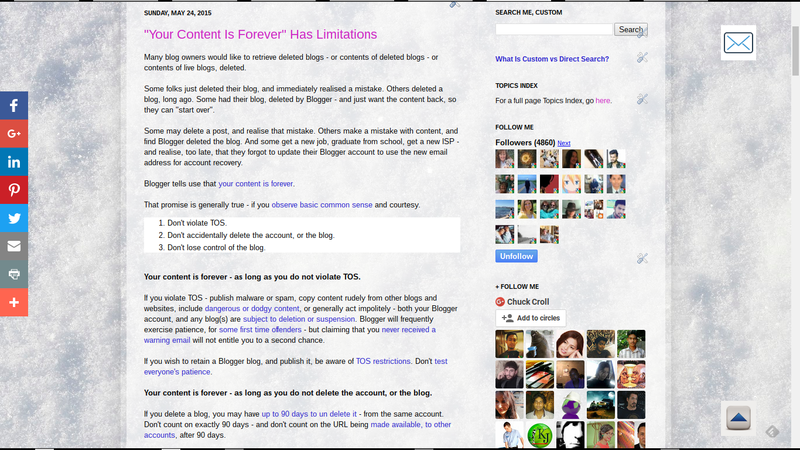 Your content is forever - as long as you do not delete the account, or the blog. If you delete a blog, you may have up to 90 days to un delete it - from the same account. Don't count on exactly 90 days - and don't count on the URL being made available, to other accounts, after 90 days. Don't try to transfer control by deleting - and don't ask to have the blog recovered, after 90 days. And if you select the new option to "Permanently delete", the blog is deleted, immediately - and with no recovery possible. Your content is forever - as long as you maintain control. If you forget the account name or password - then get a new email address, lose your phone, or get a new computer, please do not accuse Google of illegally or impolitely denying you access to your blog, if you can't use the Blogger / Google supplied access recovery tools. Blogger and Google have recovery procedures, to prevent people from maliciously gaining access to other peoples Blogger accounts, and stealing their blogs. If you act like a blog thief, expect to be treated like a blog thief. Blogger and Google can't protect you, if you voluntarily give up control. If you make a friend a blog administrator, and your friend takes over the blog, it's not your blog any more. In this case, you have legally lost control of the blog. Treat Blogger Support with respect, so they can return the treatment. Blogger and Google - and the helpers at Blogger Help Forum - want to help you. Everybody can help you best when you help them, to help you. We are advised by #Blogger that our accounts and blogs are ours, forever. This promise is not without some restrictions, however - and it's up to us to observe the restrictions, if we wish to maintain our accounts and blogs, for any amount of time.